PowerMonitor - Laser Beam Diagnostics - Laser Mechanisms, Inc. 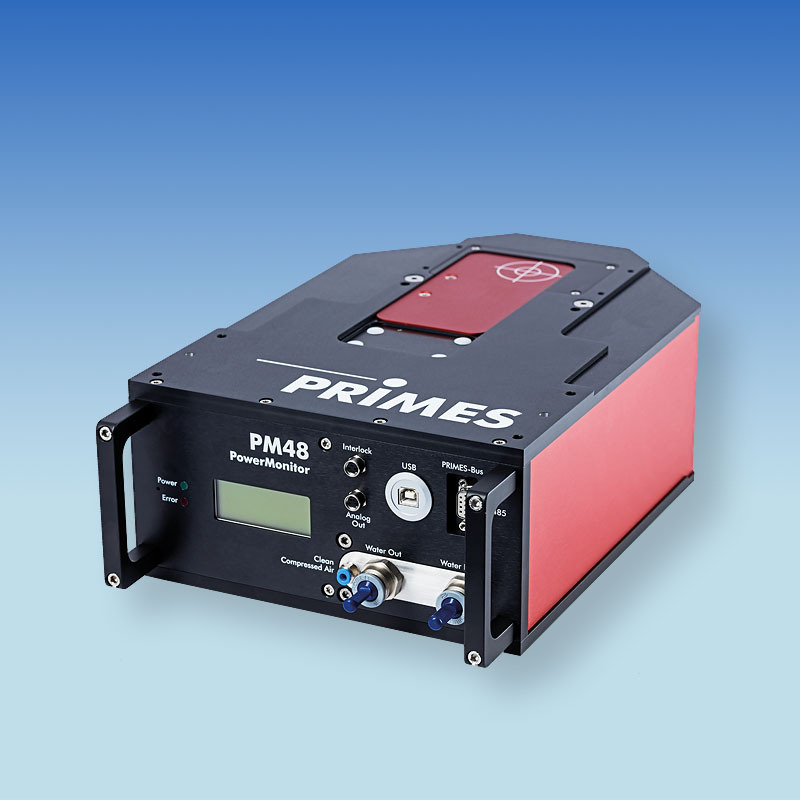 The PRIMES PowerMonitor (PM) uses the same calorimetric principle as the CompactPowerMonitor. In contrast to the flat absorber in the CPM, the laser beam in the PowerMonitor is directed via a focusable mirror into a cylindrical absorber. A highly absorbent coating has been applied to the inside of the water-cooled absorber. The cylindrical absorber allows very high degrees of absorption with minimal back-reflection. This method is suited to very high powers. All parts that come into contact with the cooling water are manufactured from copper or brass. In this way stress corrosion is effectively prevented in the cooling cycle. A pneumatic closing device protects the PowerMonitor against dirt contamination. The PowerMonitor measures the beam power of continuous wave lasers in the wavelength range of solid-state lasers (YAG) or CO2 lasers, depending on the calibration. The various models cover power ranges from 300 W to 25 kW. A system up to 50 kW will shortly be available. The PowerMonitor displays the readings on an integrated LCD display. It can also be used from a PC. This is the purpose of the graphical user interface in the PowerMonitorSoftware. It enables the analog display of present power as well as the recording of chronological development. An output signal proportional to the power (0–10 V) is also available. In addition to the irradiated power, the present flow rate, water temperature and temperature increase of the water can be displayed.